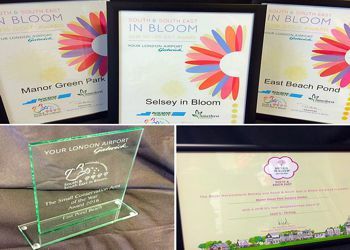 Each year Selsey Town Council enters several awards in the South East In Bloom competition to highlight the work of the volunteer groups within our community. RHS Britain in Bloom is the largest horticultural campaign in the United Kingdom. It was first held in 1963, initiated by the British Tourist Board based on the example set by Fleurissement de France now Conseil national de villes et villages fleuris), which since 1959 has promoted the annual Concours des villes et villages fleuris. It has been organised by the Royal Horticultural Society (RHS) since 2002. Over 1,600 communities around the UK enter each year, participating in their local region's "in Bloom" campaign. From these regional competitions, 80 communities are selected to enter the national Finals of RHS Britain in Bloom. The awards took place on 20th September and Selsey was represented by volunteers who support the community throughout the year and on the judging day; this included Chairman to the Council Mike Beal, who helps with judging day and provided much needed lifts to volunteers. We are grateful to all the groups and volunteers who support the Council in maintaining the green open spaces of Selsey. For full details of our South East in Bloom 2017 application download our Judges Notes.